Chenille jacquard center woven of rayon/polyester/cotton. Ruched silk sides and silk back. Finished with loop fringe. 20" x 36". Dry clean. Made in the USA of domestic and imported materials. EXCLUSIVELY AT NEIMAN MARCUS Pieced sham with textured center and velvet inserts. Mitered velvet flange. Velvet back with zip closure. EXCLUSIVELY AT NEIMAN MARCUS Pieced sham with textured center and velvet inserts. Mitered velvet flange. Velvet back with zip closure. Polyester/viscose. Dry clean. 20" x 36". Made in the USA of imported materials. Pieced damask sham with velvet insets and braid accents. Finished with twisted cording. Polyester/viscose/rayon/silk front; cotton/polyester back. 19" x 35". 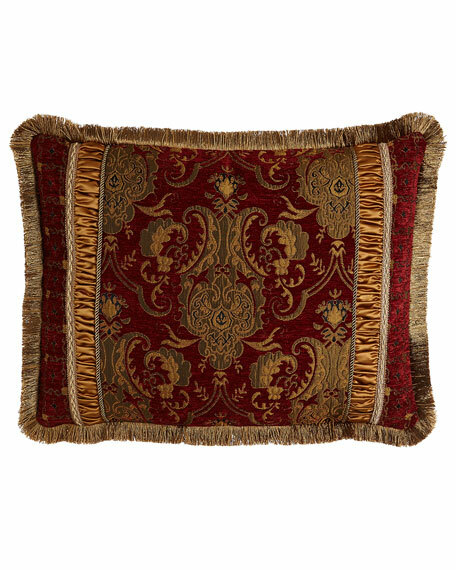 Pieced damask sham with velvet insets and braid accents. Finished with twisted cording. Polyester/viscose/rayon/silk front; cotton/polyester back. 19" x 35". Dry clean. Made in the USA of imported materials.